Tax evasion refers to attempts by individuals, corporations or trusts to avoid paying the total amount of taxes owed through illegal means, known as tax evasion fraud. This may include underreporting income, misrepresenting deductions, offshore tax evasion strategies, or or failing to file returns in a timely manner. Tax evasion penalties can have serious repercussions. The government imposes serious tax evasion sentence and penalties on offenders, including prison terms and hefty fines, for tax evasion. The U.S. government estimates that approximately 3 percent of taxpayers do not file tax returns at all. While not filing taxes can involve both civil and criminal penalties, these are usually related to the amount of tax owed. For example, if a taxpayer does not owe any taxes, the penalties for not filing are less serious. However, failing to file a tax return for a year in which you do owe taxes is a crime. For each year a taxpayer does not file a return, the penalty can include a fine of up to $25,000 and a prison sentence of up to one year. If the IRS can demonstrate that the individual or company willfully did not file in an attempt to evade taxation, the IRS can pursue a felony conviction, which could include a fine of up to $100,000 and a maximum prison sentence of five years. Although incarceration is rare, the threat is very real. Therefore, the best course of action is to file an accurate tax return on time every year. This is true even if you don’t have the money to pay the entire tax bill. In these cases, the IRS will work with you to set up a payment plan. If you need for more time to prepare an accurate tax return, such as owing to insufficient records, you can request an extension of time to file. Even if you have not filed taxes for many years, it is best to file missing returns late. The IRS computers do not automatically search for a taxpayer’s history, and the IRS wants to encourage non-filers to begin filing taxes. A similar situation applies to those who have file erroneous returns that may include underreporting income or overstating deductions. Individuals, corporations or trusts can file amended returns at any time to correct errors and avoid criminal prosecution. The IRS has nearly 3000 special agents trained to detect tax evasion. These agents have access to tax returns, the ability to gain access to further financial information, and the right to seize or freeze assets in an attempt to collect taxes. While the IRS selects some taxpayers at random to be audited every year, most audits arise as a result of tax forms that appear to be unusual. For example, if a person claims a level of deductions that is high in proportion to his or her income, the tax return may get flagged for an audit. In most of these cases, the IRS will simply increase the tax due if an error is discovered. However, if the agent finds that the individual, corporation or trust has purposefully filed a false return to intentionally evade taxes, the IRS can pursue criminal charges, which can result in a prison sentence of up to three years and fines of up to $100,000. The IRS usually uses one of four ways to notify taxpayers of suspected criminal behavior, and the manner it uses can be seen as an indication of how seriously it views the particular case. First, you may receive a non-threatening written request from the IRS asking you to file or correct a tax return. Second, you may receive a letter or phone call from an IRS representative stating a specific deadline (usually about 30 days) to file or correct a tax return. Third, you may receive a phone call or a personal visit from an IRS agent giving a specific deadline by which to file a tax return directly with that agent. 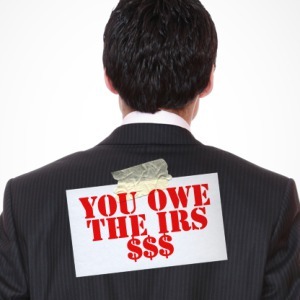 In these cases, the IRS agent may even offer to help you prepare the missing tax return. Finally, in the worst case, you may be notified by an IRS agent that you have become the subject of a criminal investigation. Learn more on how to deal with the IRS.